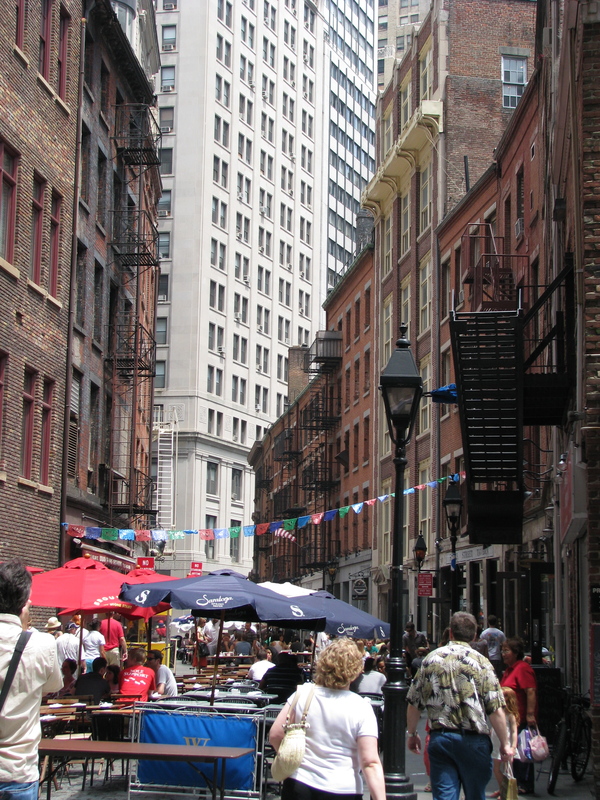 Stone Street is believed to be the first paved street in New York City. This narrow, cobblestoned pedestrian street dates back to the original Dutch colonists. Originally called Hoogh (High) Street, it was re-named Duke Street in the 1700s and then, Stone Street. The area fell into disrepair, but a revitalization effort sparked in the mid-1990s has restored this little alley to a pleasant oasis amid the bustle of the surrounding city canyons. Lined with chic restaurants and taverns, from April to October the entire street is filled with tables for outdoor dining. Choose from Japanese, Mexican, Scandinavian and other cuisines. Or, opt for the neighborhood appeal of the cozy Stone Street Tavern at 52 Stone Street. Great pub food and a friendly staff. The Financier Patisserie is a great place to grab a sandwich or an interesting salad like La Mexicaine with arugula, grilled shrimp, roasted corn and black bean relish. Chef Eric Bedoucha takes great pride in his éclairs. You can buy some of the Financier Patisserie’s own brand of cookies or packaged preserves in flavors like apricot & wild cherry. As you explore Manhattan’s financial district, be sure to forgo noshing so you can totally enjoy the ambience and cuisine of Stone Street.